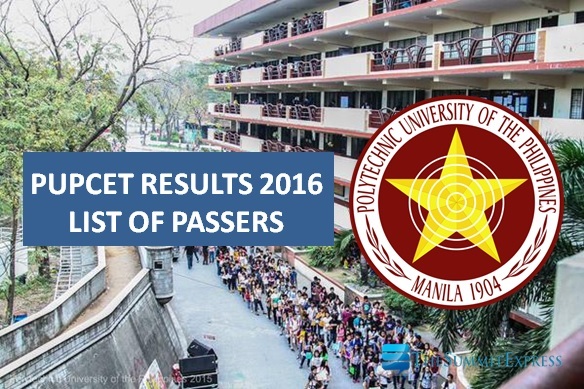 The Polytechnic University of the Philippines (PUP) College Entrance Test (PUPCET) results for academic year AY 2016-2017 were officially released online on March 8, 2016. The complete list of passers is now available on this page. PUPCET was conducted in Sta. Mesa, Manila on Saturday, December 5, 2015 (first batch) and on February 13, 2016 for the second batch of examinees. PUP named a total of 1,796 passers who are qualified for admission in PUP Sta. Mesa, Manila. For SY 2016-2017, there's a decline in number of high school graduates who took the exams due to the implementation of senior HS as part of the K-12 Program. The following PUP Branches are now accepting online application for their College Entrance Test (PUPCET) for the First Semester, Academic Year 2016-2017: Parañaque City (for Parañaque residents only), Quezon City, Taguig City, Bataan, Calauan, Laguna and Sto. Tomas, Batangas. Interested applicants may apply online. Note that each campus has an allotted specific date to show the list of its successful examinees. Confirmation of slot and schedule of application are done through the university's website, and failure to confirm slot may result in the cancellation of admission to the campus. The University advised examinees to call the PUP Admission Services hotlines (+63 2) 335-1798 to 99) and (+63 2) 335-1797 for PUP Branches and Campuses for other inquiries or question about the PUP College Entrance Test. The country's first polytechnic and largest university is using PUP iApply website for the application. An applicant is only allowed to apply and take the PUPCET in one campus and only once in an academic year. The University is committed in giving qualified and talented individuals access to quality and responsive education to support them in the achievement of their dreams and improvement of their lives.